Marcus Law insists his Kettering Town players must “enjoy what they are doing” and try to forget about any pressure that is placed on them. The Poppies boss and his squad came in for criticism following last Saturday’s 3-0 home defeat to Stratford Town – their third loss already in the Evo-Stik Southern League Premier Division this season. 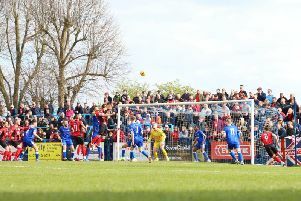 With expectations high both in the boardroom and on the terraces for a promotion push, Kettering have endured a stuttering start to the new campaign. But they hit back on Bank Holiday Monday as a second-half fightback saw them claim a 2-1 success at King’s Lynn Town thanks to goals from Brett Solkhon and Wilson Carvalho. Law was satisfied that his players “gave me everything” and, as they get ready to travel to Leek Town in the first qualifying round of the FA Cup tomorrow (Saturday), he believes his squad need to remember why they do what they do. “I spoke to the players about pressure,” the Poppies boss said. “Pressure is what comes with football but there are a lot of things in life that create a lot more pressure than this game. “And that’s something I have reminded the players about. They have to go out and enjoy what they are doing. “They have to be like they were at the end of the game on Monday and make sure they leave nothing out there. “We have to be happy with the win, they gave me everything in fairness. “We were in a situation on Monday where we had to show everyone – from the chairman to the supporter on the terrace – that we will do anything we have to do. The Poppies will be boosted by the returns of frontman Rene Howe, who has now completed a three-match ban, and central defender Dom Langdon who missed the bank holiday weekend double-header due to family commitments. The Poppies Supporters Coach will be travelling to the FA Cup game at Leek Town tomorrow. The coach will be leaving Rockingham Road at 11.00am and Latimer Park at 11.15am. For booking and more details please phone Brian 07910793276.